Geothermal series Zone Valves by Taco are designed for use in geothermal systems which have high head and allow water into the coil before the heat pump starts. It's a heat-motor, 2-way zon valve with 3-wire terminal block connection, 24V power supply and an end switch. 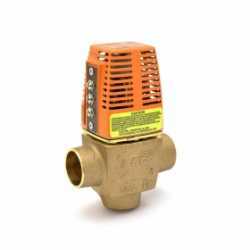 The valves are made of bronze and have a removable powerhead, which allows to service the valve without draining the system or replacing the entire zone valve. The V075T2G2ZA024Q4A1 from Taco is a 3/4” Threaded Geo-Sentry Geothermal Zone Valve. It enhances the.. The 557-G3 from Taco is a 1” Sweat 557 Geothermal Valve. It's designed to control open type geotherm.. The V100T2G2ZA024Q4A1 from Taco is a 1” Threaded Geo-Sentry Geothermal Zone Valve. It enhances the o..